We Make Good Pitchers Great! Not much has changed in the two months since this story was published. Matt Ryan is still on fire. He is still the favorite to win MVP. He has still managed to retain the art of quarterbacking while letting go of the drag that has plagued him in previous years. He needs a win on Sunday against the Packers to change the perception of his career, but make no mistake: Win or lose, he has already changed the reality. -- S.W. THERE'S A REVEALING moment in Steve Young's new autobiography, "QB: My Life Behind the Spiral," that made me think of Matt Ryan. During the 1991 season, Young's first year as a starter with the San Francisco 49ers, the quarterback visited Bill Walsh. Young needed help. A few days earlier, after a bad loss to the Raiders, he'd sat in his parked car for hours, crippled by the pressure of replacing Joe Montana. Young called friends for support, and then, at 3 a.m., having run out of people to call, he cried alone. Now, in the office of the retired head coach who had believed in him more than anyone, Young hung his head, expecting a measure of empathy. Instead, Walsh scolded him. "All you do is take the blame!" Walsh said. "What am I supposed to say?" Young said, incredulously. "It's not my fault?" After all, Young believed like an article of faith that a quarterback was only as great as his willingness to be weighed down. To account for the chaos of 21 bodies flying around on each play and unfailingly rise above, to be superhuman and immortal and, not for nothing, make it look easy. But Walsh was telling Young that he was wrong. "There's such a thing as being over-accountable," Walsh said. It was conflicting and counterintuitive, but it made sense. Young needed to learn the hardest lesson for any good quarterback striving to be great: He needed to learn how to let go. OK, SO WHAT does that have to do with Matt Ryan? Well, Ryan said something over the summer that, on the surface, sounded ridiculous. Back then, of course, nobody knew that his play would be off the charts this year, that he would become a favorite to win MVP, that he would end his slide toward becoming his generation's Norm Snead. Ryan has always been hyperaware of expectations and transparent about his desire to live up to them. He thinks deeply about what it takes -- what it means -- to be a great quarterback. For years, when he discussed his craft, it was fascinating as he delved into the magnitude of responsibility on each play. But it was also a little sad. You could feel the pressure building inside him as he spoke, almost making the game a little more complicated than it needed to be -- the curse of the over-invested. That's what made his comments over the summer so interesting. Ryan -- coming off the worst season of his career with the Atlanta Falcons -- told my colleague David Fleming that his new "thing" was to "see spots" rather than "worry so much about where defenders should be or where they're supposed to be or all those kinds of things." "Instead of getting loaded down thinking, 'In this coverage I'm going here, in that coverage I'm going there,' with so many hybrid players, so many variations of schemes and so much pressure up front and all the things that defenses can do, the way to combat all that is to see spots," Ryan said. A lot of people ripped him for that statement. It seemed like a regression or a waving of the white flag -- nonsense that a spread quarterback would say. What quarterback reinvents himself by announcing that he no longer reads defenses? But when the season started, and Ryan began to light up opponents at a rate unprecedented in his career, it was clear that this wasn't a concession at all. It was a breakthrough. OVER THE SUMMER, TMZ caught Ryan in Beverly Hills. As you might imagine, it was awkward. Ryan, polite and earnest in front of a camera, is not exactly a TMZ guy. His wife, Sarah, was so nonplused that she dropped behind him on the sidewalk, drifting almost out of view. TMZ stalked Ryan around Rodeo Drive, making small talk, and the weirdness of it left only one question: What was Matt Ryan, the least L.A. guy ever, doing in L.A.? It turned out Ryan was doing for the first time what Tom Brady has done every offseason since 2013, what Drew Brees and Andy Dalton and Carson Palmerhave also done in recent years: He was visiting with Tom House and Adam Dedeaux, two of the more renowned quarterback gurus. Over six weeks in the offseason, House and Dedeaux gave Ryan his own specialized improvement plan, cleaning up everything from his release to his diet. For most of House's career as a guru, he was careful to refer to himself as a "throwing coach," not a "quarterback coach." He worked on mechanics, not minds. But as his practice has expanded in demand, it has also expanded in scope. House puts quarterbacks through psychological testing, similar to therapy, to measure how they handle failure and how they view themselves. Now, only Ryan knows how he views himself in confession. Only he knows how hard the past few years have been, as he has grown accustomed to early vacations, not playoff appearances, the past three seasons. He has always looked young, precocious -- but now he's 31 and in his ninth year, his face a little more weathered, his psyche a little more hardened. It's reasonable to guess that he viewed -- and views -- himself as a work in progress, having achieved a lot, but he knows there's still so far to go. All quarterbacks, especially the great ones, go through crises in confidence. As with Young, we usually learn about them much later, after their playing days are over and their legacy is secure. Ryan has always said the right things publicly, even when he was taking bullets for teammates -- especially when he was taking bullets for teammates. On the play that probably haunts him more than any other -- the incomplete pass at the goal line that lost the 2013 NFC Championship Game -- his primary option ran the wrong route, crippling it from the start. Ryan dutifully accepted responsibility for it, a little over-accountability, as Walsh would say. But players later told me that Ryan made the correct read. In that pivotal meeting years ago, Walsh told Young that no matter what he is conditioned to believe, it takes 11 guys to succeed. The quarterback is the most important piece, but not the only one. Nobody wants to admit it, especially when the greats routinely transcend dire circumstances, but it's true. When scouts opine on what's different this year about Ryan, they are drawn toward the technical stuff: How House helped add a little distance on his deep ball and how Ryan's instinct to go for the jugular is meshing in the second year with a coaching staff that, unlike the Falcons' previous one, considers a red zone field goal as a kind of moral failing. But the biggest difference is subtle, noticeable only to those who have studied him. He is liberated. He is unfazed. He is not thinking. He is carrying his team. Atlanta's defense is horrible, and Ryan has led the Falcons to games of 35, 45 and 43 points on the road. But he doesn't seem encumbered by it. 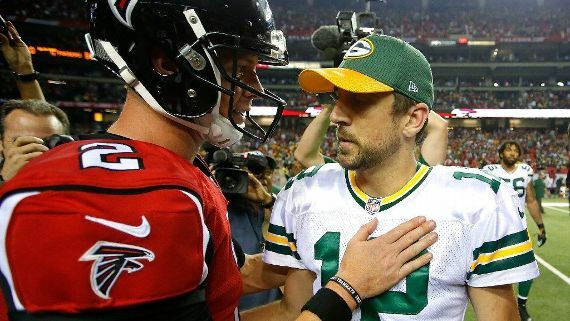 In late October, Aaron Rodgers and the Packers came to Atlanta. Rodgers has always been Ryan's measuring stick, as Montana was for Young, and it always ate at Ryan that Rodgers came of age in a 2011 playoff win at Ryan's expense. This time, though, Ryan fit a bomb between two defenders for a touchdown to third-string receiver Taylor Gabriel in the first quarter. And in the fourth, Ryan threw the game-winning touchdown pass to Mohamed Sanu with 31 seconds left. It has taken years, but it's no stretch to say that, right now, Ryan has realized that being a truly elite quarterback is not about trying to be the next Montana or the next Rodgers. It's not about deciphering every defense. It's not about folding his hands into origami as the play clock winds down to check into the perfect play. It's about unlocking what's already ingrained in him. I THOUGHT OF Young's book again when I watched Ryan's best pass of the year. It was against the Broncos in Week 5. Ryan dropped back and threw a seam route to running back Tevin Coleman. It was one of those throws that every quarterback can make in practice, but only a few can make in a game. Coleman was covered by one defender when Ryan threw the ball, and by three when he caught it. Yet he was open. Ryan threw to a hole that only he saw. It was the type of throw that goes beyond simply exploiting a mismatch. It was the type of throw that a quarterback has to get used to and grow into. It was all faith and fearlessness. Coleman scampered all but untouched for a 31-yard touchdown that would prove to be the decisive points. OK, so what does that have to do with Young? You see, there's another revealing moment in his book. It takes place in that same 1991 season, when during one game, Young didn't see Jerry Rice open downfield for a touchdown. Mike Holmgren, the offensive coordinator at the time, asked why Young didn't throw it to Rice. Young explained that, at 6-foot-1, he struggled to see over the linemen on deep routes. Holmgren replied that Rice was where he was supposed to be, and that Young needed to throw it anyway. Even if he couldn't see Rice, Young needed to trust him. What's more: Holmgren told Young that he would never be a great player until he learned to do so. Nobody can imagine how risky, if not impossible, that task is to execute: to take all of the pressure of being a quarterback in the NFL, of replacing a future Hall of Famer, of trying to live up to the expectations of yourself and everyone else, to throw the ball to a guy you can't see. It was a leap of faith that Young could conceptualize only after he compared it to his actual faith. As a Mormon, Young wrote, he always "believed in things I couldn't see." Now, if he could believe in the "unseen on the football field it might be a solution to my predicament as a player." So Young worked on throwing to windows, not receivers. It was not only a breakthrough. It not only simplified the game. It was a relief that only the greatest passers experience. Young coined a term for it: "Throwing blind." 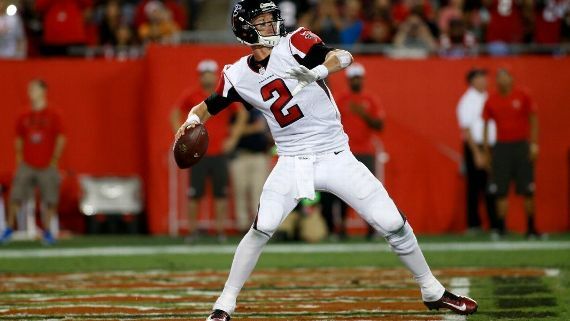 That's what all the quarterbacks termed it, until a generation later, when Matt Ryan, on the verge of a breakthrough himself, was mocked for adhering to the same ideology -- only he referred to it by a slightly different name. "Seeing spots," he called it. Why Train with the NPA? © 2017 National Pitching Association. All Rights Reserved.